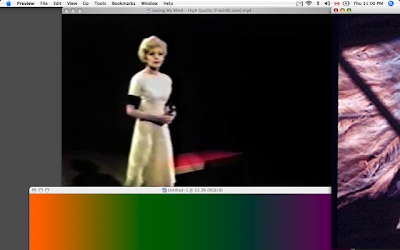 Check out the latest issue of MUSEO, which features an interview with Shana Moulton, as well as a gallery of screen captures. Friday, October 16, 2009 - 6:30 to 8:00 p.m. This year's programs call for a speculation on notions of "change," specifically some of the descriptions, procedures and perceptions associated with change that inform collective action, whether political, scientific, or cultural. The inaugural lecture is delivered by Michael A. Cohen, Director, The Graduate Program of International Affairs at The New School. The current global economic crisis demonstrates the impact on the economic welfare and political stability of both rich and poor countries of accelerating global flows of people, ideas, capital and competition for control over human and natural resources. Cohen discusses cities both as sites of the greatest impacts of global change, but also as sites providing solutions to some of the challenges that result from such change. Michael A. Cohen (Ph.D., University of Chicago) is Director of the International Affairs Program. He also works as Advisor to the Dean of the Faculty of Architecture, Design, and Urban Planning of the University of Buenos Aires. Before coming to the New School in 2001, he was a Visiting Fellow of the International Center for Advanced Studies at New York University. From 1972 to 1999, he had a distinguished career at the World Bank. He was responsible for much of the urban policy development of the Bank over that period and, from 1994 to 1998, he served as the Senior Advisor to the Bank's Vice-President for Environmentally Sustainable Development. He has worked in over fifty countries and was heavily involved in the Bank's work on infrastructure, environment, and sustainable development. He is a member of the U.S. National Academy of Sciences Panel on Urban Dynamics. Cohen is the author or editor of several books, including most recently Preparing the Urban Future: Global Pressures and Local Forces (ed. with A. Garland, B. Ruble, and J. Tulchin), The Human Face of the Urban Environment (ed. with I. Serageldin), and Urban Policy and Economic Development: An Agenda for the 1990s. 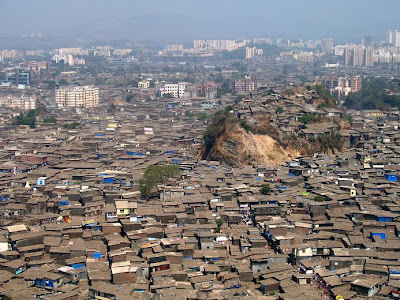 Other recent publications include articles in 25 Years of Urban Development (Amersfoort, The Netherlands, 1998), Cities Fit for People (Kirdar, ed., 1996), The Brookings Review, Journal of the Society for the Study of Traditional Environments, International Social Science Review, Habitat International, and Finance and Development. He is currently completing a study of urban inequality in Buenos Aires. He has taught at the University of California at Berkeley, The Johns Hopkins University, and the School of Architecture, Design, and Urban Planning of the University of Buenos Aires. What came to be called values. But present a world outliving us. I don't normally read OCTOBER. And not because I don't admire it. I was raised on it, but for some reason I just forget it exists sometimes. Reading some of the current issue, I was very moved by Paul Chan's "The Spirit of Recession" and Benjamin Buchloh's "Raymond Pettibon: After Laughter." Chan is one of the most intellectual and politically minded artists I know working today, and his piece goes to show it as he takes apart the cultural politics (if not the obscure economics) of 'recession' through recourse to autobiography, essay, and polemic about the state of visual arts. Buchloh's "After Laughter" is a brilliant and clear reading of Raymond Pettibon's oeuvre situating the artist's work within a tradition of fine art and political caricature. His basic argument: that Pettibon goes beyond caricature in order to invent a rhetorically slippery drawing practice that can adequately respond to post-70s Right-wing 'spin' and (post-) Reagan-era power dynamics. 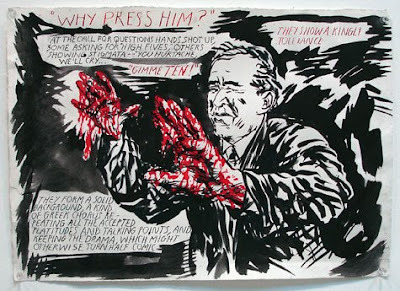 Not having written (or even had an intelligent conversation) about Pettibon's drawings before, but always having admired them, I was very moved to read something that so clearly expressed my own intuitions towards Pettibon's work. Buchloh's article makes me wonder who is taking-up Pettibon's rhetorically astute caricature among a younger generation of artists. And what writers/poets have a sustained drawing practice in the service of their politics. Twitter Crackdown: NYC Activist Arrested for Using Social Networking Site during G-20Protest in Pittsburgh * Elliot Madison was arrested last month during the G-20 protests in Pittsburgh when police raided his hotel room. Police say Madison and a co-defendant used computers and a radio scanner to track police movements and then passed on that information to protesters using cell phones and the social networking site Twitter. Madison is being charged with hindering apprehension or prosecution, criminal use of a communication facility, and possession of instruments of crime. Exactly one week later, Madison's New York home was raided by FBI agents, who conducted a sixteen-hour search. We speak to Elliot Madison and his attorney, Martin Stolar. Community formed in what remains.